At the Vaudeville Theatre you can watch a selection of plays and comedies to suit all tastes. 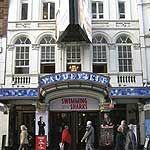 Do you work at Vaudeville Theatre? What did you think of Vaudeville Theatre? Interesting play- pretty funny, well played and well directed. Sometimes slightly far fetched though and Baxendale American accent just didn't do it for us.